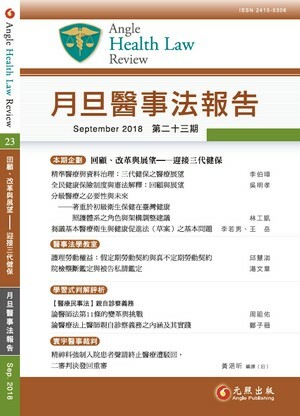 This study reviews the Judicial Yuan Interpretations (Judicial Yuan Interpretation No. 472, No. 473, No. 524, No. 533, No. 676, No. 723, & No. 753) of National Health Insurance (NHI), and analysis of National Health Insurance Act (NHIA) that how to regulate beneficiary, insurer and contracted medical care institutions. In conclusion, the opinions of the study are that although the Judicial Yuan Interpretations pay attention constitutional basic rights about beneficiary and contracted medical care institutions, but NHI still faces many challenges on finance, privacy right.